How did I get the idea for creating and publishing of npm packages? Actually, I was working on creating a dashboard with charts. As most library charts have their own convention for passing data to generate charts e.g. tui-charts, highcharts etc. while preparing data I had to rename some keys as per the required convention. I have to rename multiple keys from an array of an object. In C# or Dot Net, you have probably heard about the term "DTO - Data Transfer Object" or Automapper which provides this functionality in which it converts one class to another class type with required fields. 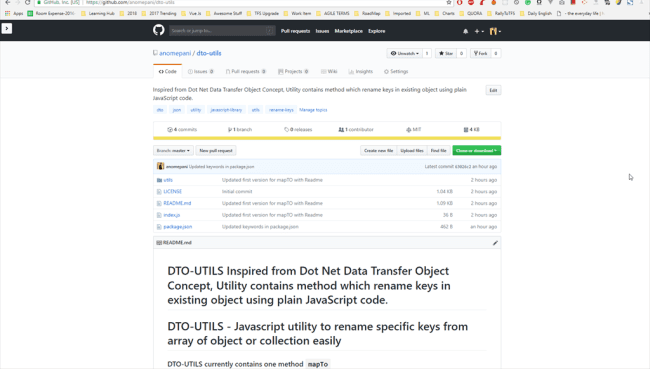 A user must have a GitHub account on which he can store source code. When you hit the above command it will prompt some required and optional information regarding packages as per the below screenshot. NoteMake sure your package name is unique in npm.js and it is available on npm. 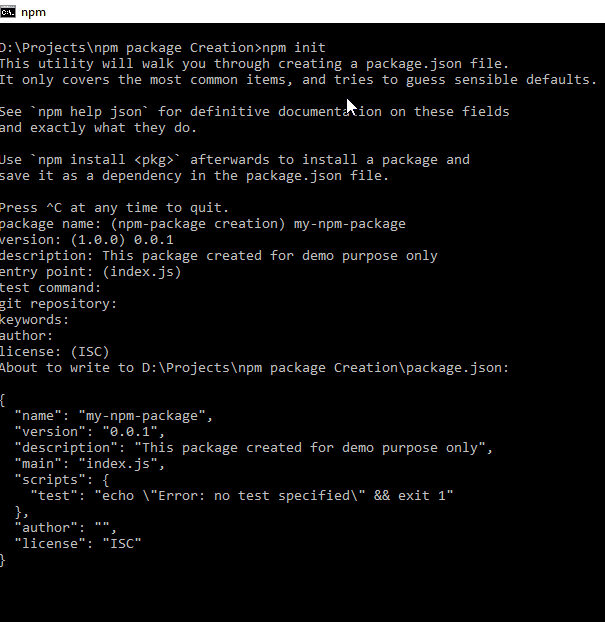 Using npm init command one "package.json file" is created in a project folder. Step 2 - Open current directory in any text editor and add entry point file index.js. I am using Visual Studio Code as the text editor. To open a project or current project directory in vs code, type the below command or you can just right click on a folder and open in your favorite IDE or Text Editor. Now create an index.js file which is an entry for any npm package and add your utility method or code to an index.js file. Take a look at my utility method or index.js file. // Restrict overwrite for existing key. //Once you injected key delete old key from object. //TODO Need to verify and modify below code if required. Step 3 - Time to create README.md file for project and check into github. You can create a README.MD file on GitHub directory by using "Create new file" button as per screenshot and update content to it as well. As per the screenshot I have created a readme file for my project and also checked in to GitHub repository. Before publishing a package to NPM it's required to commit and push your local changes on GitHub. Step 4 - As your package or utility is ready it's now time to publish the package. NoteFor publishing package, package name should be available you can test by https://npmjs.com/package/<package>. Type the below command in your terminal or in a command prompt at project directory. Once you run the below command it prompts for username, password and email address as per the below screenshot. 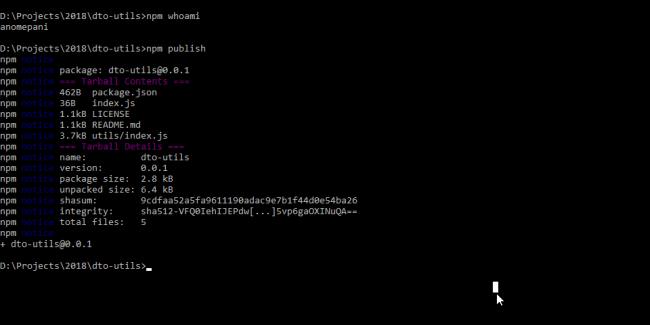 Once you successfully login into npm.js you can type the below command for a publishing package. That's it. Your package is now published at npmjs. In this article, we have learned about how to create and publish your npm package with easy steps.